Since we had some sleep to catch up on from yesterday’s travels (or was it Thursday’s? Both, I guess! ), we got a bit of a later start today, but we still got to see some great stuff. That’s the great thing about trips though. Even on days when you get a late start, you can still see quite a bit if you want to. We still took the time to plan out what we wanted to see, working from the initial ideas we had put together before the trip. Everyone plans their trips differently, but from my experience, I can’t recommend that planning enough. It doesn’t mean you have to pre-plan everything (I never have), but if you put together a list of the things you want to do and pick things from that list (and allow the flexibility to add additional things if you get recommendations while you’re there) throughout your journey, I think you’ll have a great travel experience. We were a little limited in what we would see today because of the opening/closing times of some of the sites we had planned. 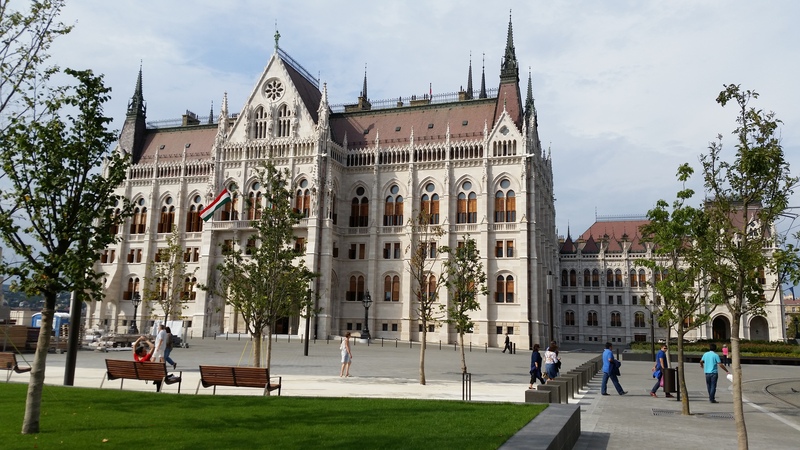 We stayed in Pest again today (don’t worry about Buda – we’ll be there tomorrow! ), but walked further, heading towards the river and walking roughly along it for part of the day. 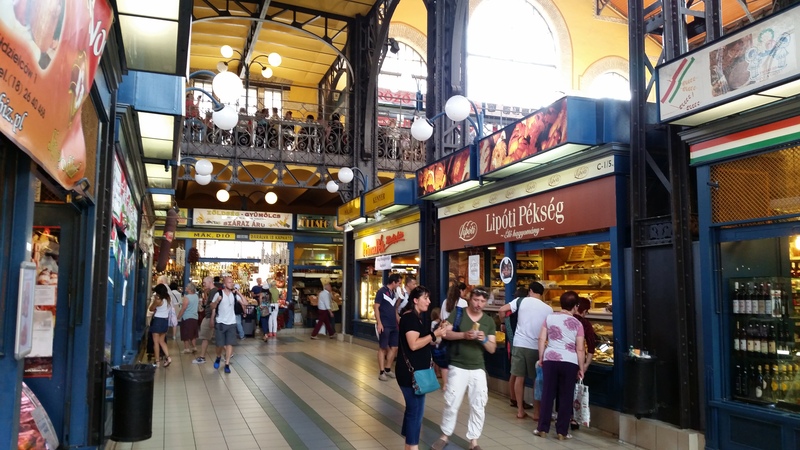 We started at the Great Market Hall, which is sort of like a massive indoor farmers’ market. Tons of stands/storefronts selling fresh meat and produce, baked goods, souvenirs, and lots more. We debated buying food to make while we’re here, but instead settled on a couple of bakery treats for later. Oops. 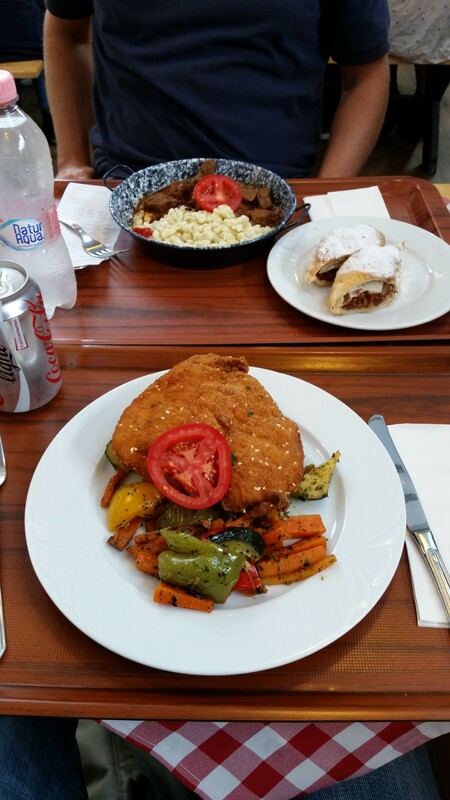 🙂 There’s a restaurant called Fakanál Étterem on the second level of the market, so we went there to try some more traditional Hungarian food. It was great! Goulash stew for Scott and Hungarian-style chicken with some amazing roasted vegetables for me. Since the market is such a busy place, I’m sure the restaurant can be pretty touristy, but we enjoyed it and I would highly recommend it. The staff were all friendly and spoke English, so it was easy for us to ask for some recommendations. Pay it a visit! 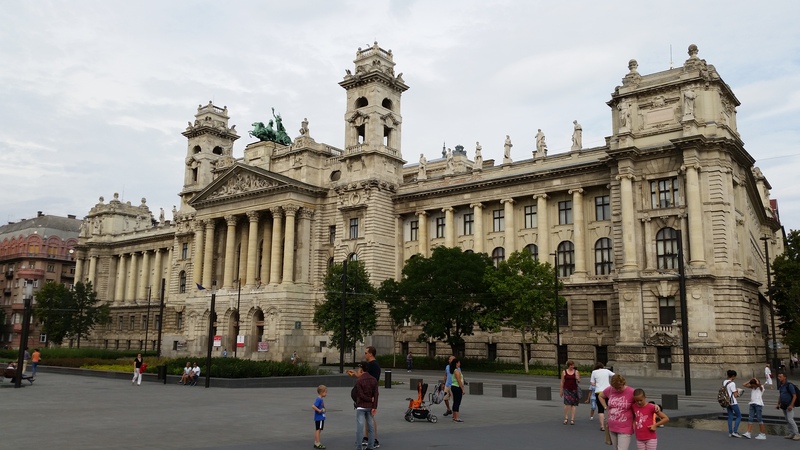 The rest of the day was spent visiting a few other locations, like House of the National Assembly (parliament), St. Stephen’s Basilica, and the Dohány Street Synagogue. I’d love to see the inside of at least some of these buildings, so that’s on the agenda for tomorrow, amongst other things. We won’t make it to everything, but that just gives us a reason to come back here someday, right? Lots of people milling around the Great Market Hall, even though it was close to closing time. 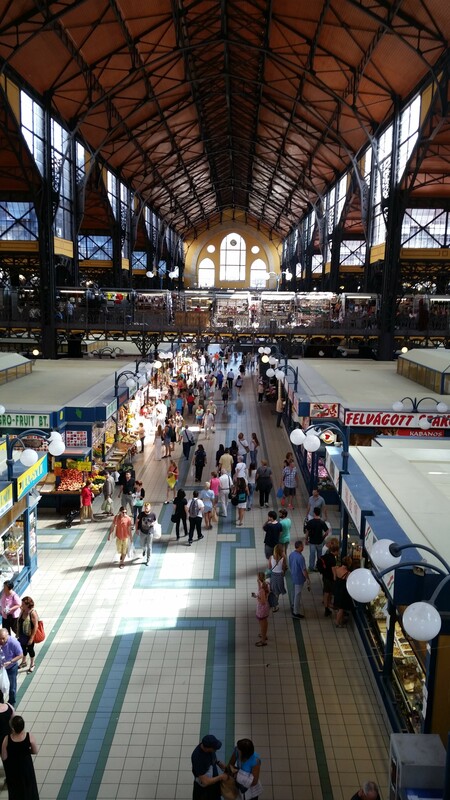 The Great Market Hall as seen from the second level near the restaurant. 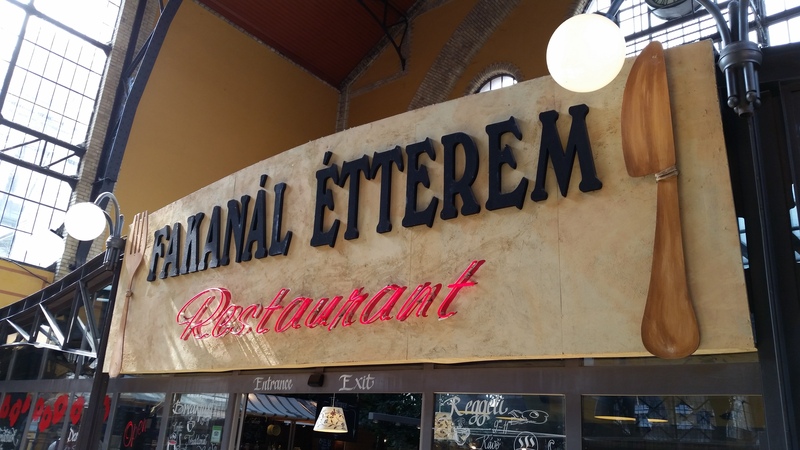 Fakanál Étterem – a good place to get a meal in Budapest! 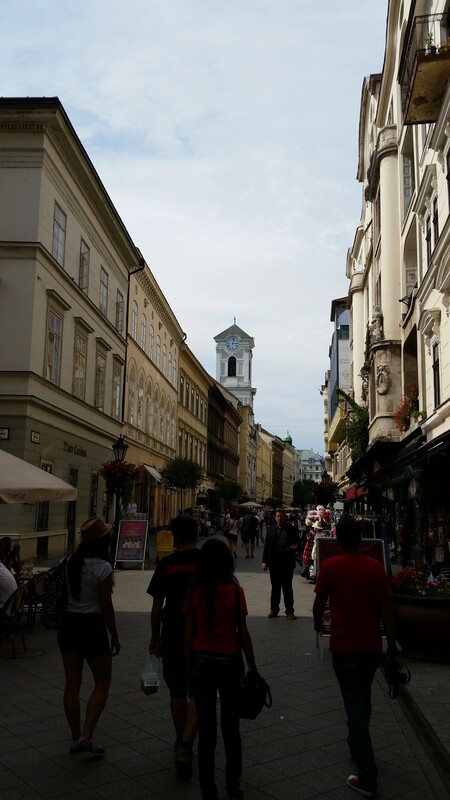 A cool street view as we walked towards the parliament building. The parliament building, which was closed, so we couldn’t go inside. Looking forward to getting a better view of it from Buda tomorrow! 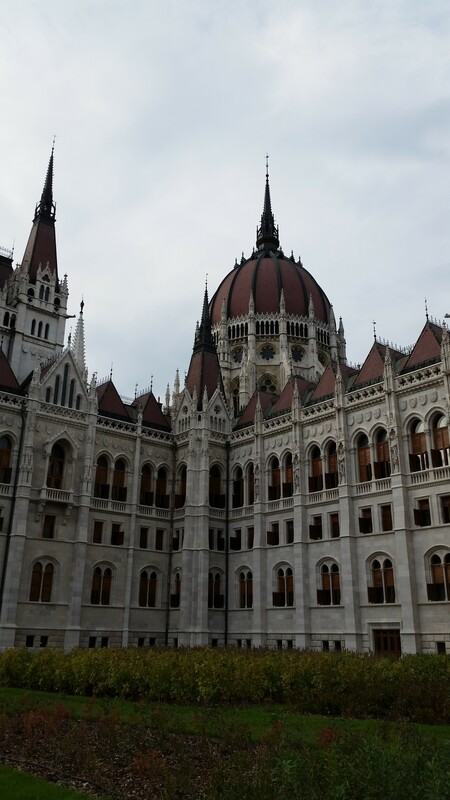 This is also part of the parliament building, but I thought it looked really cool. Wish it wasn’t so shadowy! The Ethnographic Museum, found right across from the parliament building. 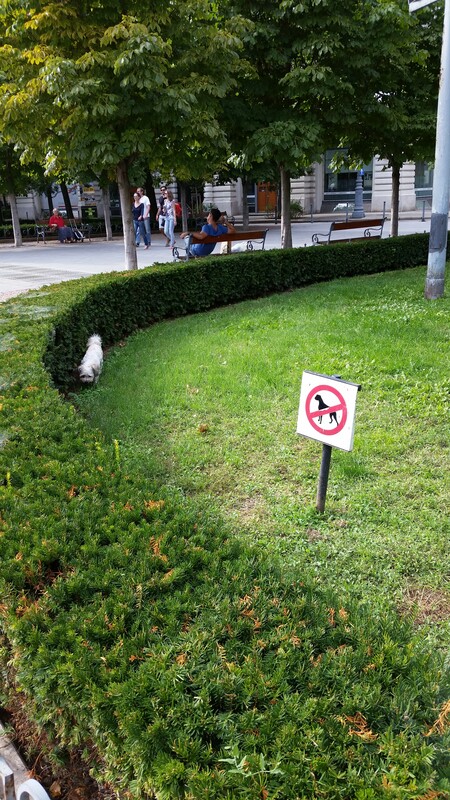 Check the sign. The irony of this had to be captured. 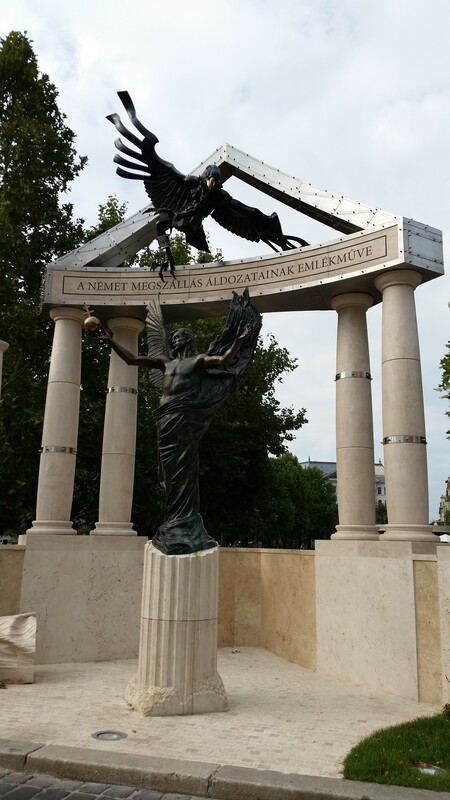 A monument to the liberation of Hungary from Nazi occupation in Liberty Square. 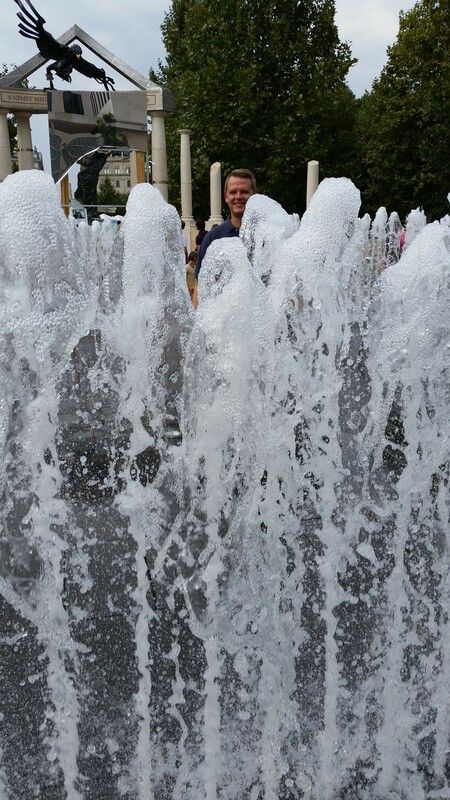 The fountain jets go down, so you can step into the middle of them. 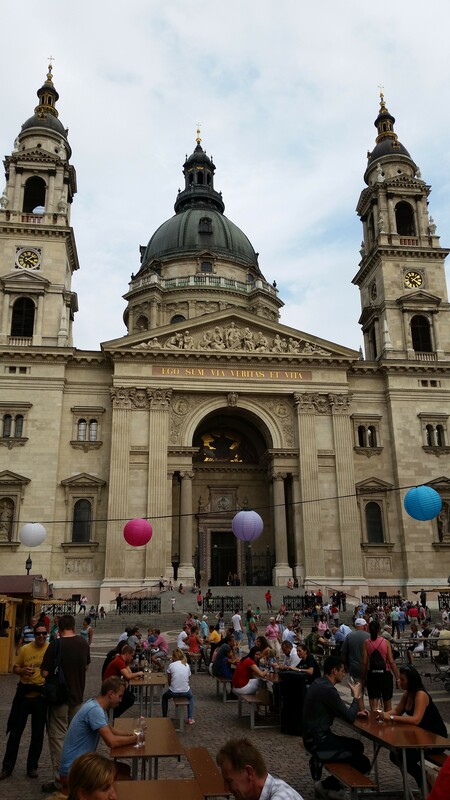 St. Stephen’s Basilica, which I definitely want to go back to tomorrow. 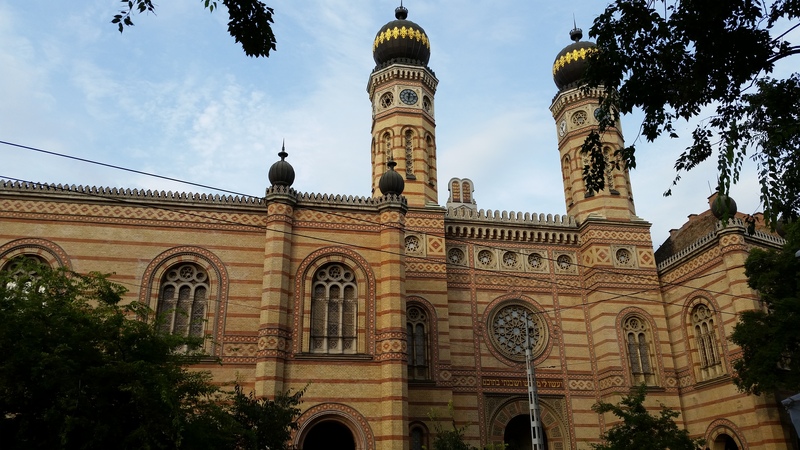 Another must-see for tomorrow, the Dohány Street Synagogue, which happens to be next door to our apartment, so it will be easy to go back to. The Great Market hall looks terrific! Love all the windows.